For many years, Juno has been touted as NASA's "low cost" mission to the Jovian system. As a New Frontiers mission, it is cost capped at only $1 billion. From its launch in August 2011 to its arrival at Jupiter in July 2016, it spends nearly 5 years in space. Yet, despite all this cost and time, it will only spend a single year orbiting and studying Jupiter. The Juno mission is set to conclude in October 2017, after completing 33 orbits around Jupiter, when the probe will be de-orbited to burn up in Jupiter's outer atmosphere. Juno's planned polar orbit is highly ellipitical and takes it close to the poles—within 4,300 kilometers (2,672 mi)—but then far beyond even Callisto's orbit. This type of orbit helps the craft avoid any long-term contact with Jupiter's radiation belts, which can cause damage to spacecraft electronics and solar panels. The "Juno Radiation Vault", with 1-centimeter-thick titanium walls, will also aid in protecting and shielding Juno's electronics. Its orbit is optimized to reduce radiation and it has inherited prior design experience from Galileo, which spent 8 years orbiting Jupiter. Neither does it appear due to be mission funding. Juno will cost $1.1b, but that is predominantly dedicated to design, construction, and launch costs. Traditionally, operations has been a large amount of the mission budget, and NASA has experience with running missions on lean budgets now (see: Opportunity). Frankly, it seems like a very low science to dollar ratio. TL;DR: For such an incredible amount of resources that have been expended, why is Juno spending so little time at its target subject? While many missions have been able to continue beyond their design lifetimes (Cassini and the Mars Exploration Rovers being prominent examples), the type of mission and orbit Juno must undertake to accomplish its goals will subject the spacecraft to a truly massive radiation dose. In order to meet the mission’s science goals within the budget set by NASA, the Juno team designed the spacecraft to accomplish its science goals in about a year, after 30 science orbits around Jupiter. If they left the spacecraft in orbit, it would eventually become too damaged by radiation to continue operating. It also won’t have enough fuel to go anywhere else (carrying more fuel means a heavier spacecraft, which means a bigger, more costly launch vehicle). So once its mission is finished Juno will be commanded to dive into Jupiter, where it will burn up in the atmosphere like a meteor. They dispose of the spacecraft in this way in order to meet the planetary protection requirement set by NASA. In Juno’s case, planetary protection means that they do not want the spacecraft to potentially crash into one of Jupiter’s moons -- especially Europa, which might contain an ocean of liquid water suitable for living organisms. The mission team studied the odds of Juno ever impacting Europa if they left the spacecraft in orbit around Jupiter. They determined that the odds were very low, but it’s a risk NASA will not take. So the de-orbit maneuver allows the mission to ensure a controlled end to the mission and avoids that risk. Note that the Galileo spacecraft survived for about 8 years at Jupiter, but its orbit kept the craft far away from the planet for much of the mission. Juno’s science requirements (in particular, high-resolution sensing of the gravity field and deep atmosphere) require a very close orbit. The only feasible way to accomplish this with current technology is to have a polar orbit that repeatedly dives very close to Jupiter while ducking below the most intense regions of radiation. Even with this special orbit, the spacecraft’s external surfaces will receive a radiation dose equivalent to 100 million dental x-rays. Inside the radiation vault that contains Juno’s most sensitive electronics, the dose will be a factor of 800 lower. In the end, these choices represent a carefully considered balance between cost, meeting mission requirements and managing risks to mission success. Not the answer you're looking for? Browse other questions tagged nasa spacecraft jupiter mission-design juno or ask your own question. What is the typical power redundancy built into a spacecraft? 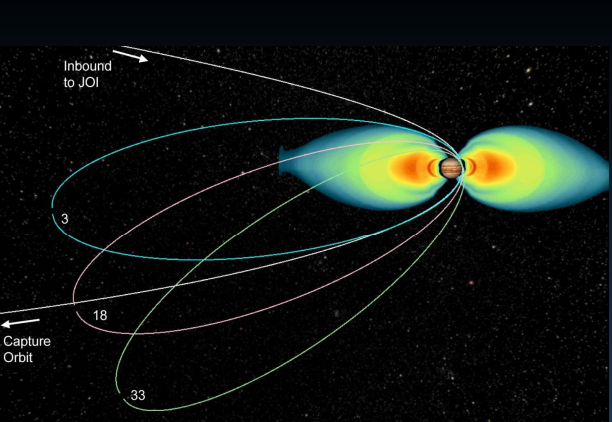 If Juno's long orbit means a lower rate of radiation damage, why the planned short orbit?